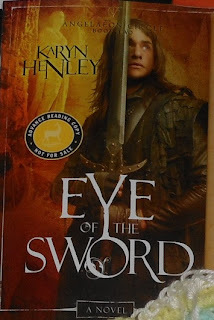 Eye of the Sword by Karyn Henley is a sci-fi fantasy adventure. I found it comparable with many of the best fantasy series out there. Fantasy is probably my favorite fiction genre, and I was riveted. My biggest "complaint" is that I'll have to wait so long to read the next in the series. Most of the book takes place in the kingdom of Camrithia, though we also journey to Eldarra and The Dregmoors. Our hero is Trevin, a reformed thief who is being named a Main (like a knight) of Camrithia. He is in love with the Princess Melaia, daughter of the King of Camrithia and Dreia, a now deceased angel. While her father is trying to prepare her to rule his kingdom someday, she is more concerned with continuing her mother's work and reuniting the three harps from the destroyed Tree of Wisdom to restore the Stairway to Heaven. Her work gets disrupted when the Prince of the Dregmoors arrives, offering peace between their two kingdoms in exchange for marrying Princess Melaia. Trevin's fellow comains have all disappeared. He is sent by the king to find the comains, and by the princess to find the harps. He suspects the Prince of the Dregmoors has something to do with the comains disappearance and must solve both of these quests or risk not only having his love marry another, but perhaps marrying an evil foe. And of course, this goes beyond love, beyond Camrithia, because time is ticking away. If the harps aren't united by a certain alignment of time, the stairway will never be restored and evil will win. It's really a great tale, filled with action, treachery, and great characters. One thing I loved about Trevin was how much depth he has. He is not a perfect Prince Charming, but instead a weary sinner in need of redemption, and yet still used for good. Instead of sorcerers and such, this fantasy series has angels and other heavenly beings. I'm not saying the angels are in line with Biblical angels, but this is a novel. I highly recommend this book, and even though this is the only one of her books I'd read, based on reading it I'd check out Henley's other books as well!